It took me back to Mazatlan. I left the resort pool and walked down the small steps to the beach where vendors were selling dresses, sunglasses, jewelry. The sand was warm on my bare feet and I walked quietly through the dry sand, my face to the sun, the wind in my hair... When a pain shot up through the ball of my foot into my ankle. I looked down to see a bee still stuck in the flesh of my foot. I was immediately angry. I looked around to see hundreds of bees in the sand. 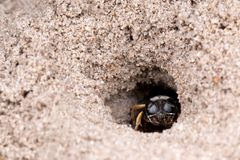 They had built a nest nearby in the base of a rock and a hotel worker was trying to kill them by covering them with sand... Not a great plan. As I thought about this in class, I remember that it felt offensive. I was enjoying the stillness, the relaxation. True, I stepped on the bee so technically it was my fault but it was so unexpected and jolting. I could no longer enjoy a beach memory without the pain of the bee sting. Sometimes memories are like this. A pleasant time, like childhood, can become a painful recollection because of unexpected pain. I leave the resort pool and walk down the small steps to the beach where vendors are selling dresses, sunglasses, jewelry. The sand is warm on my bare feet. I walk quietly through the dry sand, the sun on my face and the wind in my hair. I find a plastic beach chair and spread out my towel. I reach for my iPod and scroll through the songs to find Gotye. The hotel waiter comes over and asks if I would like a drink. I order a piña colada, of course. He also informs me that there was a nest of bees close to here this morning but they sprayed, killed them, and took the dead bees to the landfill. The sand is clean. I walk through this new memory again and again. Now I walk in the warm sand with peace.